Sachin Kumar Deshmukh received his Ph.D. in Biotechnology at Rajiv Gandhi Proud Yogiki Vishwavidyalaya/ National Institute of Immunology (India) on the biology of infectious diseases and recombinant vaccine development. 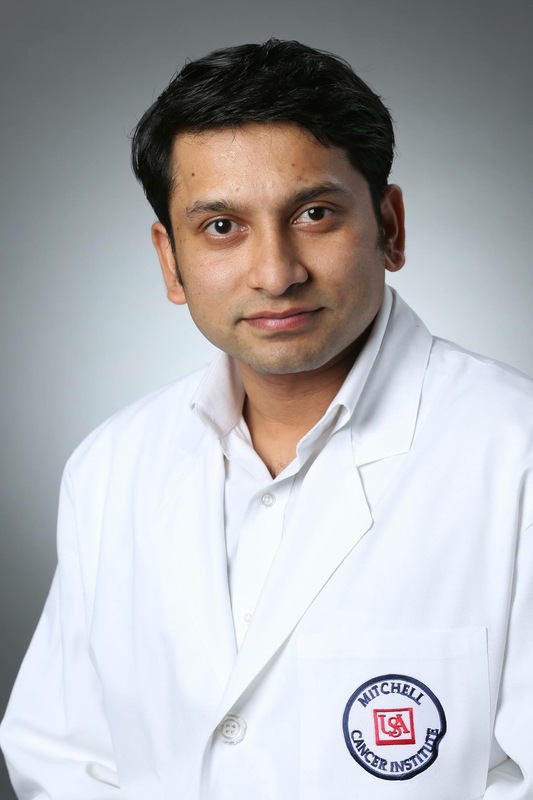 Presently, he is working as Postdoctoral Fellow at Mitchell Cancer Institute, University of South Alabama, USA. His current research is to explore the mechanism of cancer progression and understanding of cellular and molecular pathways that influence the tumor microenvironment. His scientific interests focus on the development of immunotherapeutic approaches and targeted therapies. His long-term career goals are to develop novel and effective therapeutic intervention against cancer. 1. Deshmukh SK, Srivastava SK, Tyagi N, Ahmad A, Singh AP, Ghadhban AA, Dyess DL, Carter JE, Dugger K, Singh S (2017). Emerging evidence for the role of differential tumor microenvironment in breast cancer racial disparity: a closer look at the surroundings.Carcinogenesis. Apr 18. doi: 10.1093/carcin/bgx037. 2. Deshmukh SK, Srivastava SK, Zubair H, Bhardwaj A, Tyagi N, Al-Ghadhban A, Singh AP, Dyess DL, Carter JE, Singh S (2017). Resistin potentiates chemoresistance and stemness of breast cancer cells: Implications for racially disparate therapeutic outcomes. Cancer Lett. Jun 28;396:21-29. 3. Deshmukh SK, Azim S, Ahmad A, Zubair H, Tyagi N, Srivastava SK, Bhardwaj A, Singh S, Rocconi RP, Singh AP (2017). Biological Basis of Cancer Health Disparities: Resources and Challenges for Research. Am J Cancer Res. Jan 1;7(1):1-12. 4. Solanki A, Bhatia B, Kaushik H, Deshmukh SK, Dixit A, Garg LC (2017). Clostridium perfringens beta toxin DNA prime-protein boost elicits enhanced protective immune response in mice. Appl Microbiol Biotechnol. Jul;101(14):5699-5708. 5. Tyagi N, Srivastava SK, Arora S, Omar Y, Ijaz ZM, AL-Ghadhban A, Deshmukh SK, Carter JE, Singh AP, Singh S (2016). Comparative analysis of the relative potential of silver, Zinc-oxide and titanium-dioxide nanoparticles against UVB-induced DNA damage for the prevention of skin carcinogenesis. Cancer Lett.Sep 28; 383(1):53-61. 6. Tyagi N, Marimuthu S, Bhardwaj A, Deshmukh SK, Singh AP, McClellan S, Carter JE, Singh S (2016).p-21 activated kinase 4 (PAK4) maintains stem cells-like phenotypes in pancreatic cancer cells through activation of the STAT3 signaling. Cancer Lett.Jan 28; 370(2):260-7. 7. Tyagi N, Arora S, Deshmukh SK, Singh S, Marimuthu S, Singh AP (2016). Exploiting Nanotechnology for the Development of MicroRNA-Based Cancer Therapeutics. J. Biomed. Nanotechnol;12: 28-42. 8. Tyagi N, Bhardwaj A, Srivastava SK, Arora S, Marimuthu S, Deshmukh SK, Singh AP, Carter JE, Singh S (2015). Development and characterization of a novel in vitro model system of UVB-induced skin carcinogenesis. Sci Rep.Sep9; 5:13894. 9. Deshmukh SK, Srivastava SK, Bhardwaj A, Singh AP, Tyagi N, Marimuthu S, Dyess DL, Dal Zotto V, Carter JE, Singh S(2015). Resistin and interleukin-6 exhibit racially-disparate expression in breast cancer patients, display molecular association and promote growth and aggressiveness of tumor cells through STAT3 activation. Oncotarget.May 10; 6(13):11231-41. 11. Mathur DD, Deshmukh S, Kaushik H, Garg LC (2010). Functional and structural characterization of soluble recombinant epsilon toxin of Clostridium perfringens D, causative agent of enterotoxaemia. Appl Microbiol Biotechnol. Oct; 88(4):877-84. 12. Chhabra G, Sharma P, Anant A, Deshmukh S, Kaushik H, Gopal K, Srivastava N, Sharma N, Garg LC(2010). Identification and modeling of a drug target for Clostridium perfringens SM101. Bioinformation. Jan 17;4(7):278-89.